There are striking similarities between my current project Core Society and Grove Script which was the first domain specific programming language I’ve ever written. It was a really fun project on two levels: It’s fun to come up with a domain specific language of your own and then write a parser for it and an interpreter, where, for a change, optimization for speed is actually justified. But once you have established that new interface to talk to your computer the *real* fun can begin: To figure out how to use that new language and see what you can do with it. When you already know a systems inner workings and can change it on a whim if something doesn’t please you the learning experience isn’t even painful. Core Society is like this. It’s about programming cellular automata. 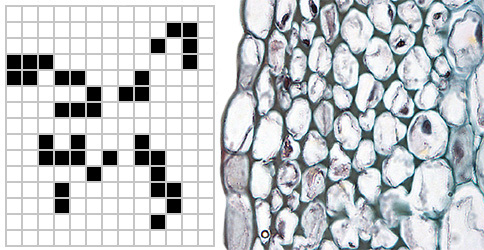 Cellular Automata are a well known concept in computer science. Typically you have a regular grid of cells, each in one of a finite number of states. Based on a set of rules you can look at a cell and it’s neighbours and decide on the cell’s next state. Now you just apply these rules repeatedly to all cells in the grid. It’s amazing to think about the complexity that can emerge from even simple setups. Take Conway’s Game of Life for example where each cell has only two possible states (on/off) and where only four simple rules define a cells next state based on itself and the local neighbours. And despite that it’s not only capable of generating complex evolving patterns, you can even build a Universal Turing Machine with it! But why simple rules and simple cell states? When I hear the word ‘Cell’ I think of the building blocks of all known living organisms, capable of self-replication and functionally quite complex. I wanted to step away from simple, rule based systems and towards the complexity of living cells. Why not build a cellular automaton where each cell is a fully programmable little computer? 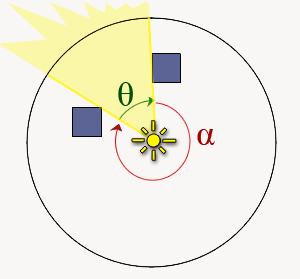 No external rules would decide how a cell’s state would change – only the initial programming of the cores would determine the course of the simulation. 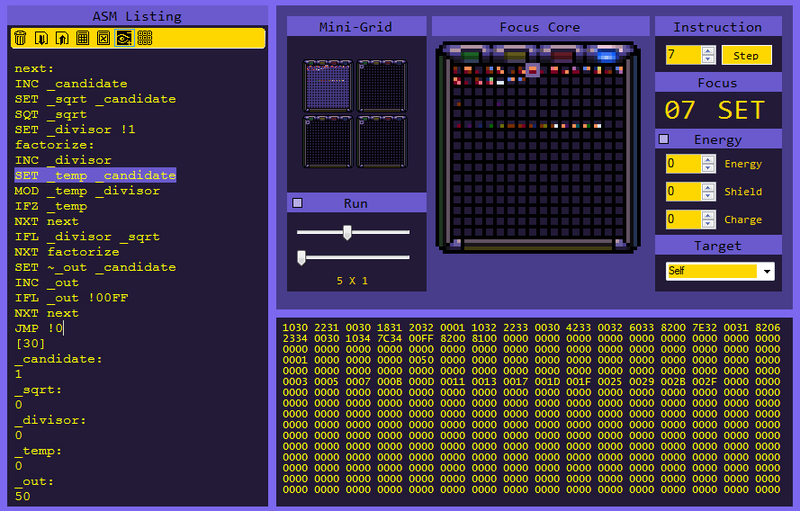 I’ve never written an emulator before but that was exactly what I needed to do next – just that I wasn’t emulating an already existing computer system but a system I had yet to define. A system specifically designed to serve as a programmable cell in a CA. The architecture I’ve settled with acts like a von Neumann machine where instruction and data share the 256 16bit words of memory. That means the whole memory is mapped to an 8bit address space. Because I can’t use less than a word (16 bit) to encode an instruction I figured there are enough bits left to encode additional information along with the instruction – including the target address the operation is meant to operate on. All other computer systems I know don’t have instructions that operate directly on memory. Not only because they have a far larger amount of addressable memory but also because they are designed to run efficient on physical hardware and memory access is a bottleneck. Thus most CPU’s have a couple of registers to store binary data in. When you program for those CPU’s in assembler you typically spend a lot of instructions copying data between registers and memory and I was pretty excited about a chance to get away without it. Apart from that a lot of the basic instructions in CoreSociety’s assembly language will look familiar if you know other assembly languages. Here’s the full list. After planning the instruction set from a semantic point of view I needed to figure out how to map the instruction and all relevant parameters to one or, if the instruction is more complex, two words of memory. To be memory-efficient not all bits encode the same kind of information in every instruction. For example not all instructions have a second parameter. The INC instruction just increases the value at the given address, while the SET instruction replaces the value at a given address with a new value that also needs to be supplied. If an instruction expects a second parameter the next word following the instruction is assumed to encode this parameter. Here’s how it works in detail: The highest four bit of an instruction word always encode the instruction group. If a group consists of complex operations that require two operands only 2 bits are available to identify the group member. 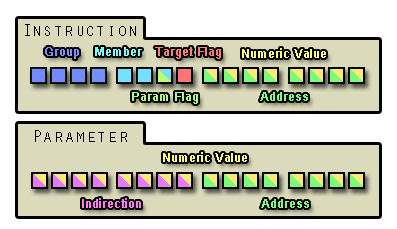 The 3rd bit (Param Flag) will encode whether the following parameter word, that encodes the second operand, is interpreted as a numeric value or as a pointer to an address. So there are 16 distinct groups possible that can either consist of 4 complex or 8 simple instructions. More then enough for our needs. The next bit is the Target Flag and it tells the processor how the lower 8bits of the instruction word, that always encode the first operand of the operation, are to be interpreted. When it’s set the operation’s target is not an address but a numeral value or an address reached by indirection. Indirection means the passed address is not used directly as the target but read to get another address which is then used as a target. When a second parameter is required the word after the instruction can either be interpreted as a 16 bit numeric value or an address that can be either supplied direct or by (recursive) indirection. To verify the architecture I’ve build a prototype IDE to write and run core programs in. Basically you write a listing of a custom assembly language which is immediately compiled into a core’s memory. The core’s memory is visualized as colored blocks and also written out in HEX numbers. You can step through the code and watch the operations change the memory. The assembly language is pretty simple. There’s a 3-letter mnemonic assigned to each instruction followed by one or two operands. You can use labels to assign names to specific memory addresses and use those names instead of the actual address. Comments are also supported. This is the IDE where the cell-programms are written and tested. Click for an unscaled version! It’s surprising what you can do with just 512 bytes. A program to calculate prime numbers that I wrote as an early test-case was only 17 words long, leaving more then enough room to store the primes. Another positive side-effect of such tiny memory is that you can visualize all the data with a couple hundred pixels. I found it pretty fascinating to watch the little cores work! 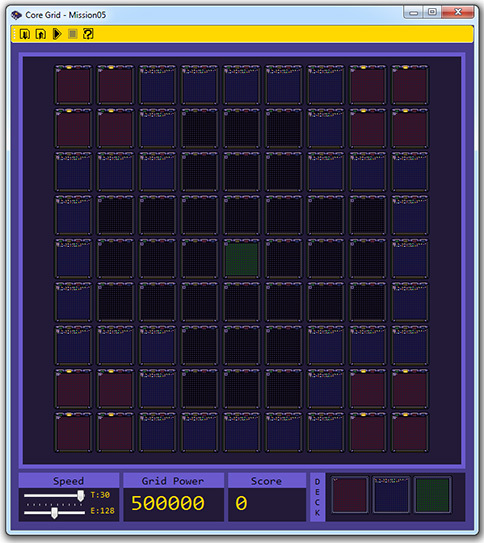 A core viewed in the IDE spending 255 energy on calculating primes. The last primes it finds is 19, then he runs out of energy. The next step after implementing the virtual system that would represent a cell in the Cellular Automata was to put a bunch of them together in a grid so that they could start interacting. This is the GRID the simulation takes place. Each tick the core with the highest unbound energy get’s to execute an instruction. Energy is distributed cyclical until the energy budget is spend! With the basic set of instructions in place I needed to figure out the rules by which cores (e.g. the cells) would be able to interact with their neighbours and how the system would decide which core would get to execute an instruction next. The straight-forward solution would be to just let them execute one instruction one after another and to add some instructions to read and write the memory of neighbouring cores. But I’ve settled with something more complex. I had this grand vision that Core Society might evolve into a platform for competitive programming games. Like an arena where you’d try to write the perfect program to beat a challenge or compete with other programs for grid space. So I added an energy mechanic that governs the execution and interaction of programs. Energy is a precious resource that each core accumulates over time. It is spend when a core executes instructions. A core can spend energy to shield itself, preventing adjacent cores from writing into it’s memory. It can also reserve an amount of energy that when released allows the core to execute a number of instructions uninterrupted. There is an instructions that allows you to transfer energy into a neighbouring core. And one to drain energy from it, respectively. So with a few bytes a core can be programmed to copy it’s program to neighbouring cores. Once the program has spread over multiple cores those can work together to establish dominance of the grid against competing programs or fulfil whatever goals they were programmed to. Last but not least – to facilitate the creation of scenarios – I added an instruction to raise and one to lower a global score. It serves as a metric to gauge efficiency of a solution to a scenario. Obviously the more excess energy you can spend on raising the score the better the final score will be. The initial board state could involve some cores that lower the score constantly so a high scoring solution would need to be very efficient in gaining control of these cores as fast as possible. The green core is calculating primes, supported by the grey cores who provide it with energy! The blue cores try to prevent the red core from taking over the board by spending their energy to keep a shield up and supporting neighbours. If you’d like to see more than animated gifs I’d suggest you check out Core Society’s Github repository or download it’s content as a ZIP. It includes a precompiled executable, full source-code, documentation and a couple of scenarios including reference solutions. You might need to install the .Net Framework 4.5 redistributables if you don’t have them installed. Click on the top left icon to open a scenario. A click on the ‘Play’ Icon starts the simulation. You can click on a listing in the ‘Deck’ to open the IDE window that allows you to modify the listing. The changes will automatically apply to the initial state of all cores that show the listing’s color. To learn more about the instruction set and how to program a core have a look at the Documenation. If you’ve got questions and can’t find answers in the docs just comment below! In the past months I’ve been reading up on procedural generation and emergence. My reasearch led me to develop a scripting language to be able to interactively ‘program’ L-system based fractal animations. It’s meant to be easy to pick up and modify, so it might be a nice sandbox for people that would like to learn to program or just want to engage in a session of creative coding. It’s quite fun once you’ve gotten the hang of it! I think every programmer has dabbled with Fractals at one point. I remember generating Mandelbrot images on the very first computer my family owned. Last fall Josh Parnell pitched his project Limit Theory on Kickstarter. His claims sounded way too ambitious for a one-man project, yet he raised more then 350% of the funding goal. So why did people trust him to pull it off? His pitch video was featuring quite some cutting-edge procedural generation technology. This project rekindled my interest on that topic. I found a pdf copy of the book “Algorithmic Beauty of Plants” and was intrigued. The basic concept of L-System is simple enough. It’s grammar based rewriting system, a theoretical framework for modelling the development of simple multicellular organisms, introduced 1968 by the Hungarian theoretical biologist and botanist Aristid Lindenmayer. But the above book introduced me to more advanced variants of L-Systems, adding context sensitivity, randomness and parameters. The examples were quite impressive and my urge to experiment with it irresistible. Usually L-Systems define a bunch of production rules that operate on strings of symbols. When a rule is applied it replaces a sequence of symbols in the string (the predecessor) by a different, typically more complex sequence (the successor). The more iterations you perform the longer and more complex the string of symbols becomes. Symbols are statically defined to do a very specific thing like rotating or moving a cursor to generate a rendering. Imagine the above string of symbols were generated using L-Systems. F is defined to move forward, + to rotate left and – to rotate right. This method of programming line based drawings by controlling a cursor through commands that move and rotate it relative to it’s current state is called Turtle Graphics. The programming language Logo designed for educational use first introduced it and it’s quite intuitive to grasp. 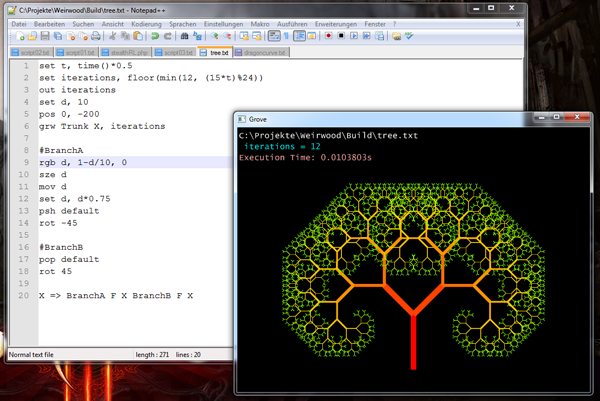 My experiments turned into a little scripting language to interactively ‘program’ L-system based fractals, called Grove Script. At first it seems like it does nothing special as it is based on the concept of using turtle graphics in conjunction with L-systems, too. But, instead of statically defining an alphabet of symbols that the productions operate upon and that have a specific meaning when executed, in Grove Script the symbols refer to executable code. The key idea is that instead of programming everything like in your typical programming language or forfeiting the flexibility of procedural languages completely like in your typical rewriting system Grove Script brings both worlds together. It allows you to use rewriting rules to create complex sequences of procedure calls by applying simple rules to equally simple axioms. And unlike most other script- or programming languages where writing and running the program are separate steps Grove Script is aiming to allow users to develop fractal renderings and animations in an fun, intuitive process: There’s no compiling or restarting required when you change the code. You get instant feedback on your changes. I let Bret Victor explain why that’s a good thing! You’re free to use your favorite Text Editor to write Grove Script. But when the script you’re editing is running in the interpreter every changes you make will be instantly incorporated. Context Sensitivity – Rule can require multiple tokens to be encountered in order. Parametric Tokens – Tokens can have a parameters attached. Consequences – Rule-specific code can be executed whenever a production triggers. Great to raise some counter variables. As mentioned before I use the concept of Turtle Graphics in Grove Script. All pixels are drawn by the turtle, controlled by only a handful of straightforward commands. Besides commands to modify the turtles spatial state you can set the size, transparency and color of the line. That’s it. There are other commands to save and restore the interpreter state on a stack – very important to generate branching structures. There’s an instruction to call subroutines or a list of subroutines. And of course those subroutine-lists are ideal to be generated with L-System-inspired productions. So you got a command to initialize a list with the axiom and one to apply a ruleset. Last but not least you can define variables through commands that can be used in algebraic and boolean expressions. But all in all there are only a dozen commands you have to familiarize yourself with to unlock the full potential of Grove Script. I found a way to handle all the usual control flow (conditional branching, loops) with 3 basic instructions that operate on code blocks marked using Tab indentation. Gate – When condition evaluates to false, skip all following commands of the same or greater depth, except other Gate instructions op’s of the same depth. Using these control-flow instructions to the desired effect is a little counter-intuitive though. So to improve the usability I added macros that will unfold to the required operations when the interpreter parses the script. Macros blend well with instructions and improve readability. Being able to write code that uses familiar words like “while, until, repeat, if, else” hopefully appeals to people with and without programming background alike. The interpreter is written in C++ and quite fast. It renders even complex fractals that require thousands of instruction calls in real-time. If it’s possible to render 60 frames per second it would be a waste to never change the output. By using the time() function in expressions you can generate fractals that change over time and render animations. Another important function in that regard is random() which provides you with pseudo random numbers. You can use the time() to calculate the random seed to be used by the PRNG and suddenly the randomness is under your control. It took me a while to figure out how to use these elements in conjunction with productions but once you’ve gotten the hang of it it’s quite easy to script quite impressive looking vector graphics that let you forget that everything you see is rendered with the plain olde Turtle Graphics approach. Excuse the poor quality. I just captured the interpreter with Hypercam instead of rendering to video directly. To experience Grove Script the way it’s meant to be you should check out the Github repository. There’s a precompiled interpreter, full source-code, documentation, examples and a half finished tutorial! Feel encouraged to try it for yourself: Start Grove.exe. Drag&Drop some scripts from the example folder to the application. You can edit the script while Grove executes it and it will adapt at run time. If you’ve got questions and can’t find answers in the Docs or from the tutorial just comment below! There’s no reason this shouldn’t compile on Mac or Linux. If you want to make your own build you need the Cinder Framework – the rest is just plain standard C++. //value of the time() function. //Thanks to the modulo operate age wraps around at maxage. //each structure should look unique. //apply the ruleset 'r1' as often as the plant is old. //fun info: how many buds were generated? //render 'plant' twice - mirrored. //Now the Tokens that the L-System operates upon are defined. //The rules are evaluated in the order of appearance. The following wall of text contains musings on how todays video games are missing their potential. I analyzes the game industry’s focus on surface values and why that’s a bad thing. I argue that photo-realism isn’t required for immersion, and point out what is instead. I draw parallels to the state of AI research. I critizise a lack of investments in R&D and a stagnation despite video games being far from realising their potential. Read it! I wanted to create games for the better part of my life. I enjoyed playing video games but what fascinated me was their yet unfulfilled potential. 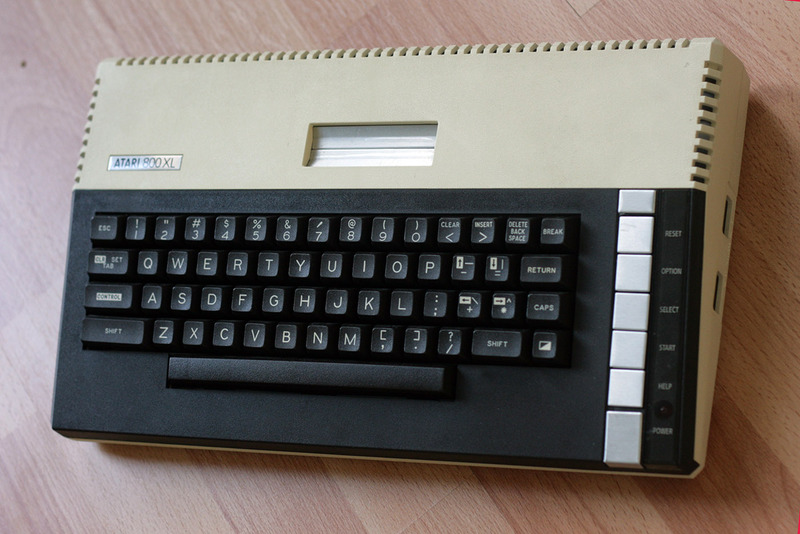 Hardware was growing more powerful at a staggering pace and games were the only kind of consumer oriented software that could motivate people to upgrade their systems every two years. It was this synergy between hardware and video games that allowed both industries to prosper. We were witnessing the birth of a new medium and I wanted to have a part in shaping it. Moore’s law, the prediction made in 1965 that the complexity of integrated circuits would double every two years, remained surprisingly accurate for over half a century. The improved capabilities of electronic devices changed our lives profoundly. When I’m surfing the net with my smartphone, reading a book on my kindle, depending on amazon, google, wikipedia or the navigation assistant to solve my day-to-day problems I realize that technology has advanced way beyond what I could have imagined 15 years ago. Video Games on the other hand turned into a disappointment. Not because my career plans failed – I have studied multimedia engineering and make my living in the games industry. But the product is not what 15-year-old me would have expected videogames to be like in 2013. Not remotely close. That’s a thought provoking revelation for someone that devotes most part of his waking hours to games. You want to display an Animation in Flash. The animation consists of a number of frames, each is saved as a small image somewhere on your HD. You wonder: What is the best way to do it? If this scenario applies to you, here is one possible answer that does not require the Flash IDE or any full blown framework. It involves a free tool and a couple of small classes (also free) that should be easy to integrate with your project. Step 1: Create an Image Atlas out of the individual images. What is an Image Atlas? A big image containing many small ones side by side. Also known as Texture Atlas or Sprite Sheet. Why do we want one? Because it’s easier to embedd one image file than many. It’s also reducing the size of the SWF because it compresses better then individual images. We’ll use a tool called Texture Atlas Generator to create our image atlas. Check “PNG” so an image atlas is generated. Check “Pack Transparent”. This will pack the images as small as possible by removing empty pixels. The 17 original images have a resolution of 128 x 64 each. 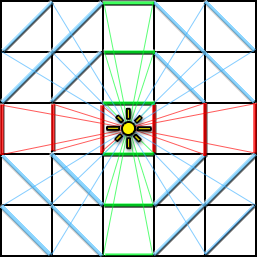 The image atlas has a resolution of 400 x 182. So the same animation takes up roughly half the amount of pixels. Check “TXA” to generate another file that stores meta information e.g. what frame went where in the image atlas. All other options can be un-checked. Step 2: Embedd the image atlas and the meta data in your Flash. As described in my other blog post you can embed all kind of data in a SWF. Step 3: Use the ImageAtlas and AnimatedBitmap class to display the embedded animation. In the Code Sample you’ll find a couple of classes from my library of custom code. Feel free to use them for your own projects. In this tutorial we’ll use the ImageAtlas class to unpack the individual frames from the image atlas and the AnimatedBitmap class (that behaves just like a normal Bitmap class with some extra functionality) that we will add to the stage to display the animation. Step 4: Make it your own. You probably want to have a look in the source code (to learn what AnimatedBitmap can do) and wrap the functionality with your own code. 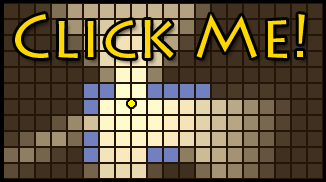 The AnimatedBitmap has a couple of functions that make it flexible to use. You can toggle wheter you want the animation to loop. You can set the current frame yourself or let it update automatically (by calling the play method). You can reassign new frames so you could store a lot of different animations in the same image atlas. Running, Slash, Jump and so on. So one image atlas and one animated bitmap could be enough to display a full character. You just have to change the sequence of frames you want currently played e.g. 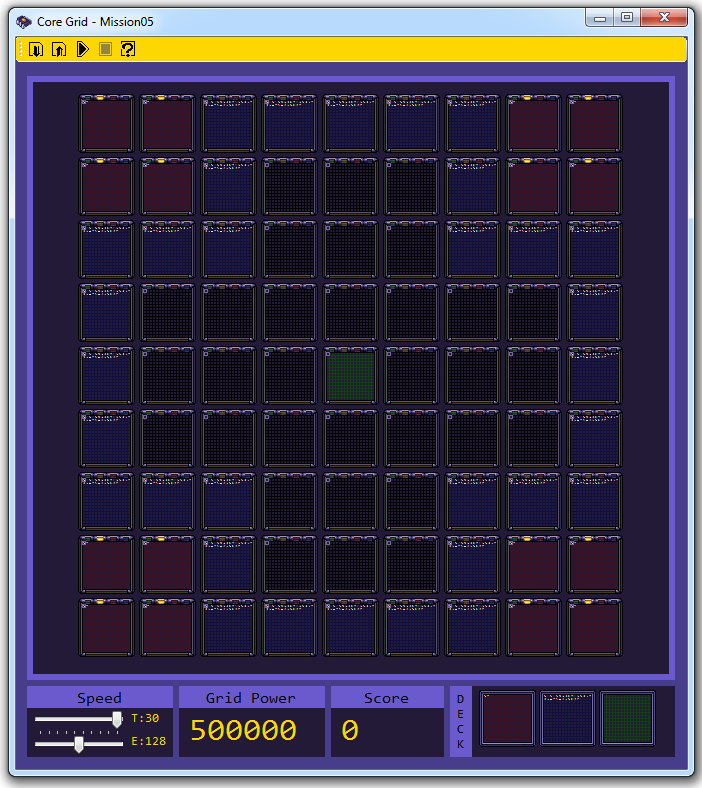 assignFramesByName("jump001", 14) to play 14 frames of jumping. You can pass a callback function as a parameter to the play that is called when the last frame is reached (and the animation isn’t looping) to play a follow up animtion. I hope this tutorial has given you something to get started with! Feel free to post further questions in the comments. Copyright Notice: The sprite I used in the demonstration is public domain and consider the code used in the sample as released under the MIT license. I have a domain, webspace and unlimitted traffic… there is no good reason beyond lazyness to not host my own blog. 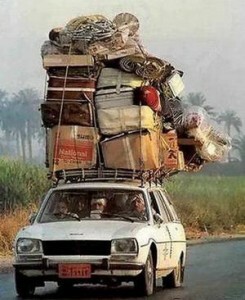 So, no more forwarding to wordpress.com for I found the time and bravery to make the move! I hope everything still works. In the days to come I’ll explore the new customization options that I now have. Here’s a real-world example of how we handle the assets in our current flash game project at my company. It’s a rather big browser game that uses several megabytes of resources (XML meta-data, PNG & JPEG Images, Sounds and Movieclips) that we have to deploy to the serves and load into the client when needed. In such a scenario managing the dependancies between the code and the assets can be quite challenging and timeconsuming. This post is a little advanced and you should be allready familiar with embedding and dynamically loading resources in Flash. 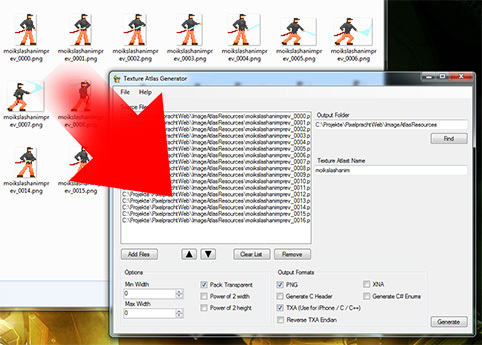 The content creators create assets file by file and save them to a folder structure. Thanks to the magics of version control systems (SVN in our case) these ever growing amount of assets is synced between all collaborators. But someone has to make sure everything is available at runtime when the application needs it. To embedd all resources using the [Embed] tag in the game’s source code would cause several problems: The size of the SWF would be huge as all assets that are potentially needed would have to be included. Each embedded resource has to be added when you build your project so compile times would explode. And as we’re using FlashBuilder we would have to write some lines of code for each embedd asset. But who’s going to maintain that? Gamedesigners and artists change, add and delete files to the repository but they don’t have the means (and inclination) to edit source code, so who’s keeping it synced? 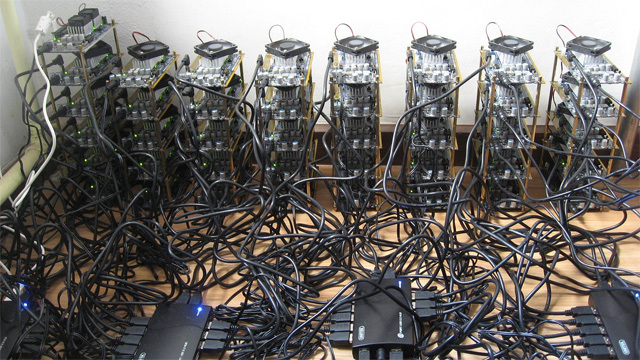 A contrary approach is to put all resource files on server and load them at run time. But different types of resources require different code to load, if you require many resources at once you have to open one connection for each resource (adding a lot of overhead) and you have to keep track of multiple loaders. Lastly many resource files are compressed efficiently when embedded into a SWF and it’s sad to miss out on that kind of optimization. So we’ve decided to setup an asset pipeline that converts our assets into a format that is more optimized to the needs of the runtime environment. Such a system is a common thing in “real” game development but unusual for flash game development – maybe because traditionally Flash applications are authored in an IDE that has build in functionality for asset management. Flash Builder doesn’t have anything like that but luckily it’s based on Eclipse, a software development environment with an extensible plugin system. One plugin (part of the “Eclipse Java Development Tools”) adds support for “Apache Ant” build scripts to Flash Builder. Ant is a tool for automating software build processes. What to build with it? 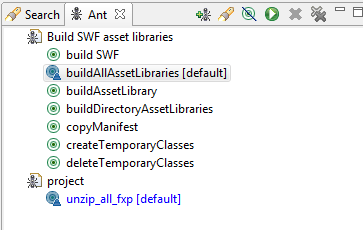 SWF’s that contain only assets as embedded resources, get uploaded to the server alongside our game SWF and when resource are needed the appropriate resource-packs are loaded at runtime to make the embedded assets available to Flash. But our Ant script does a lot more then just invoke a compiler to build some AS3 files. It also generates these files on the fly. So the manual work required to embedd all our assets into some dozens of resource packs reduces to clicking a button. So, what happens when we click? For a flash game project at work I needed to setup a flash.geom.Matrix instance to transform points from cartesian space into an isometric perspective. 1. How do the properties a, b, c, d, tx and ty map to the coefficients of the matrix? 2. How to use the matrix to transform a Point? The Matrix class provides two methods to transform a point. deltaTransformPoint transforms a point without applying the translation. transformPoint transforms a point including the translation. If you know the mapping of coefficients and a bit of computer graphics that’s the expected behavior. 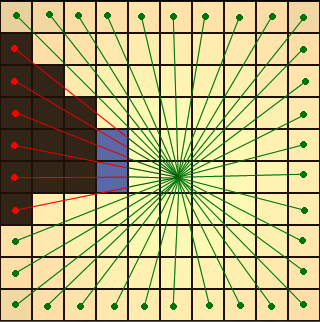 To be able to multiply a 2D vector with a 3D matrix you introduce an extra 1 as 3rd component. Then perform a matrix multiplication. That way the transformation is added to x and y after the rotation/sheering is done. 3. How to setup the matrix to get the desired transformation? If none of the provided methods fits your need (like in my case) you can set the correct values for the coefficients directly. That’s easier then it sounds. Look at the basis vectors of your source coordinate system and imagine (or calculate) how they look like after the transformation. Assign coefficients a the x and b the y value of the transformed x-axis. Assign the x and y value of the transformed y-axis to c and d.
If you need it you can set tx and ty to move the transformed points relative to the new origin. And why do I blog about math, now? Adobe managed to have a incorrect illustration of the layout of the coefficients in the german doc (english docs happen to be correct!) and the inscrutable description of the transformPoint and deltaTransformPoint methods lacked the specifics I needed. Let’s hope this post and the power of google will help those, that seek the same kind of knowledge!